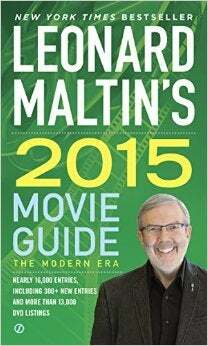 Reading Robbie Gonzalez's article about Mat Honan's lament for the iPod Classic made me think of another entertainment colossus that was recently, and just as quietly, retired: Leonard Maltin's Movie Guide, which is ending with the 2015 edition published just last month. Maltin was, like his contemporary Roger Ebert, a crucial figure in making classic movies and the language of film criticism accessible to a mass audience, and like Ebert a big part of that appeal was personality. If you saw him on Entertainment Tonight or The Today Show, he was clearly a fan who could communicate his enthusiasm for the medium to readers in plain language. And he probably couldn't have gotten the Guide published in the first place if he hadn't been a fan. He assembled the first edition of the book, titled TV Movies, in 1969, at the age of seventeen, before the Internet, before personal computers, before the era of home video or cable, relying almost entirely on memories and handwritten notes. It was a remarkable achievement for one so young, but it also represented a radical idea: that the entirety of movie history could be captured in a thick, but not especially unwieldy paperback book, kept close by the TV for quick reference. (Not unlike the idea of carrying one's entire music library around with them in a pocket-sized device.) The book was aimed at folks who wanted to know if the Late Show airing of Red Dust, Murder, My Sweet or Mothra was worth sitting through, but it also appealed to people who were curious about the other movies Maltin mentioned, who would scan the listings to see if they were on that week, and in doing so, helped to create dedicated movie fans out of casual viewers. The book would go through two more editions in the '70s, before video became widespread; after 1978, the Movie Guide became an annual publication, and remained so until August of this year. The '80s and '90s were a Golden Age of Maltin-style guidebooks, and I got interested in them just around the same time my parents bought our first VCR, in 1984. In addition to the Movie Guide, there was Roger Ebert's Movie Home Companion, Mick Porter and Marsha Mason's Video Movie Guide, Pauline Kael's 501 Nights At The Movies, Halliwell's Film Guide, and many others, including Michael Weldon's Psychotronic Encyclopedia of Film, John Stanley's Creature Features, and Danny Peary's Cult Movies and The Guide For The Film Fanatic. They varied in quality and type, but they taught me that it was possible to examine movies critically, to have an articulated opinion about them beyond just "It sucked" or "I kinda liked it." By the time I graduated high school I had a whole shelf of the things, which I consulted frequently and obsessively. As recently as ten years ago, most of these books were still in print, many in updated editions. But the speed and accessibility of the Internet, and the rise of free online resources like IMDb and Wikipedia, effectively made them redundant and instantly out-of-date. The decline of the genre parallels the decline of the VHS and DVD booms that made them invaluable in the first place, and the big box retailers who sold both books and movies on physical media. Nowadays a lot of movies are free to watch, or at least readily available anywhere with a decent broadband connection for a small fee. Outside of TCM and oddball local channels, there are fewer places where you can stumble on a classic movie or cult film entirely by accident at 3 AM. The system is designed to reward giving people "what they want" based on previous behaviors (which is rather more passive when you actually think about it) not the kind of serendipity that arises from flipping through the dial or a book at random. If you like dumb cheapo zombie comedies, Netflix is just going to suggest more of the same. If you like mopey brolk-rock, Spotify and Pandora will give you more performers who sound like Mumford & Sons. Enjoy YA dystopian novels about beautiful people who worry nobody likes them? Hey, Amazon will suggest more of the same! The weird, the random, the accidental are totally removed from the system, and the chances of stumbling across some movie or book or song that totally changes your life forever is greatly reduced. We're seeing a sea change in the way people relate to media, and it feels oddly cold and disheartening, at least to me. There is a cornucopia of amazing stuff online and on the traditional channels, but it often seems like the "Long Tail" concept has fizzled out in favor of more blockbusters and narrower categories aimed at smaller niches. Like Honan says, digitized culture has been commoditized to the point where it often feels like a thin, algorithm-refined gruel. That's not to say that there isn't a lot of great movie writing online; there's wonderful stuff on io9, and the Onion's AV Club, and The Dissolve, and there are a ton of great film blogs and critics. (I really like my fellow Texan Matt Zoller Seitz, now ensconced at Roger Ebert's site.) But you have to know to look for it, and I think that's a legacy skill that isn't necessarily being passed on. Movie guides taught me to think, to seek out stuff, to keep an eye open on the horizon. The Internet was supposed to do the same thing. I don't know if there's still room for an Ebert or Maltin-type culture hero for curiosity, but we sure could use one.